The answer? The answer is simple. The thing with art is that… it can move people that you’ve never even met. Most of think of ourselves as just a tiny little speck on the radar of the universe, but that’s not entirely true. Because of his seriously un-matchable ability to entertain, that is why Faren here nagged (haha, thank you guys) all of her friends and writers at the Books & Brews Community Blog to compile a list of kind words, fun stories, and memories of the most magical man to grace the Earth, Stan “The Man” Lee. I hope you enjoy. Ally F. on Stan Lee’s character Ultimate Spiderman. Ally is a Brewlegger at Books & Brews Zionsville & Blogger at Books & Brews Community Blog. Amber is a friend of the Books & Brews Community Blog. Matt is a Shift Lead at Books & Brews Zionsville & Blogger at Books & Brews Community Blog. Sam is a friend of the Books & Brews Community Blog. Stan “The Man” Lee… If there ever was a God who walked amongst us, it was him. My relationship with my father growing up was definitely heavily peppered with the heroes Stan Lee wrote into existence. I also honed my illustration skills with “How to Draw Superheroes the Marvel Way,” (which Lee hosted/published with legendary artist John Buscema). I grew into the person I am today because of the imagination and writing of Stan Lee. Jasin T is a friend/reader of the Books & Brews Community Blog. 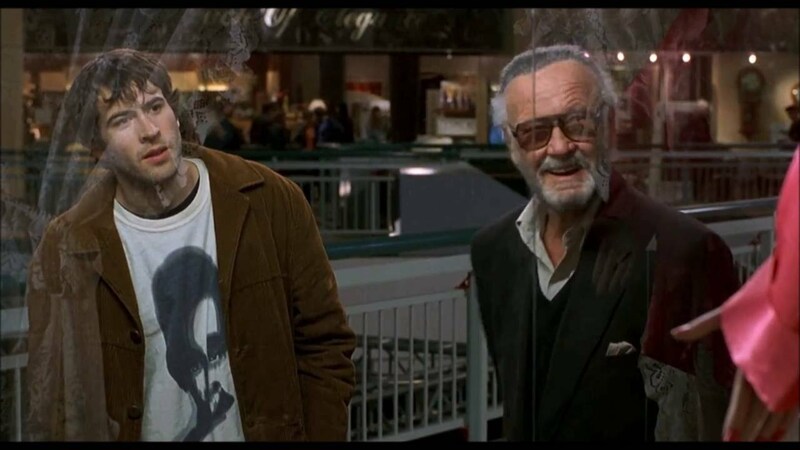 Mike H. on Stan Lee’s advice in Mallrats. Mike is a regular at Books & Brews Zionsville. Faren on Stan Lee in Mallrats. Faren is the Taproom Manager of Books & Brews Zionsville & Admin / Blogger at Books & Brews Community Blog. Paul is a friend of the Books & Brews Community Blog. In a Spider-Man cameo, Stan Lee once said, “You know, I guess one person can make a difference” and that really stuck with me. It makes me believe that no matter what I do, even if it’s small, it can make a difference somewhere, even if I’m not Spider-Man. Chelsea is a Brewlegger at Books & Brews Zionsville. Rob is a friend of the Books & Brews Community Blog. Aaron is a friend of the Books & Brews Community Blog. “When you think about the names of authors that have given us great heroes, people to model ourselves after, Stan Lee is not typically one of the greats named. Homer’s Achilles gave us someone strong, invulnerable and brave. Palisander gave us Heracles’ 12 Labours, stories of defying fate and overcoming all obstacles. Geoffrey of Monmouth gave us the once and future King of England. Arthur in his white castle of Camelot. So why rank Stan Lee up there with these giants? None of his characters ever shined as brightly as these characters, none of them even come close. None of his stories that he “actually” wrote has ever entered the cannon of great western literature. So why do I mourn the passing of the quirky old man who scribbled a few nonsense words into the corners of some colored sheets about silly characters that were barely heroic in the classical sense? It is because his characters were barely heroes. Stan Lee entered a comic world with greats like Superman and Wonder Woman. Characters every bit as perfect and shiny as the marble busts of the classical heroes of old. And rather than embracing that world he gave us a real vision of a hero’s life. His heroes were real. They were dirty. They had human feelings and desires. They had human problems like finishing your homework on time, marital strife, alcoholism, and abuse. Stan Lee wasn’t great because he made a bunch of new heroes. He was great because he democratized heroism. He gave those of us who read his comics a sense that no matter who we were: a teenage loser with a brain, a brilliant man who made a mistake, a billionaire with a drinking problem, that we could be heroes every bit as great as Theseus fighting the Minotaur. We could all save the world if we simply had the will to do so. We could be beaten and broken by society, born different than the rest of the world, or just haunted by our own demons. It didn’t matter. We could be the heroes we saw on the pages of these little animated sheets that came out every Wednesday. His vision of what a hero was challenged us all to become something more than we were. His writing can be criticized, his actual contributions can be debated, but the one thing that cannot be argued or taken away is his vision. So, thanks Stan. Thank you for making me better, for making the life of a little kid growing up in Indy better, and thank you for making the world the adult me now lives in better because you shared something with us. Maybe we will all learn to share ourselves and the world might become better still. All of us the heroes you thought we could be. Excelsior. Nathan is a Shift Lead at Books & Brews Zionsville. Rob is a Brewlegger at Books & Brews Zionsville. “When I began collecting comics, I lived in Germany. This was in 1985, when I was ten. At that time, Marvel did not distribute in Europe (they had a phony “Marvel” line for those markets—unrelated to the continuity and super-dumb), so unless you were an army-brat with PX privileges, you had only one option: you could mail-order subscription comics to your house. This was a tricky process back then as no Xerox machines were available. I LITERALLY used scissors to cut subscription forms out of the back pages of my books (don’t stone me!). I was not a savage; I knew the damage I was doing to my collectibles, so I only subscribed to as many books as possible at once. My first subscription was for a year’s worth of Avengers, Classic X-Men, Daredevil, Uncanny X-Men, and West Coast Avengers, a fraction of the available titles of the day (I still curse not picking Squadron Supreme and GI Joe over West Coast and Classic!). And as I built my nerve to cut a next section out, I would pore over the subscription page of each issue with special focus—balancing collect-ability with accessibility. If you were a Marvel collector, you know that this page was the home of the Bullpen Bulletin (at that time, written by Jim Shooter) and also Stan’s Soapbox. In the early years, I read the Bulletin with an especial whimsy, imagining myself one day being a penciller at 387 Park Avenue South (which I wrongly thought was in the Empire State Building). I dreamed of working in Stan Lee’s bullpen. But I also read his ‘Stan’s Soapbox’ with that strange wonder that young people have for such things. As far as I knew, the words in those yellow rectangles might be the words of a god. He told us that bigotry has no place in America there (which we knew because of how Cap punched the Nazis so hard) and that bullies need to be stood up against (which we knew because of how Daredevil did it so consistently) and that we should always be our own best advocates, because even Marvel could mess up a subscription and—if Stan heard about it—he’d comp your subscription and apologize to you by name for it. Micah is a Blogger at Books & Brews Community Blog and Regular at Books & Brews Zionsville. Rest in peace, Stan Lee. You will forever be missed. Excelsior!